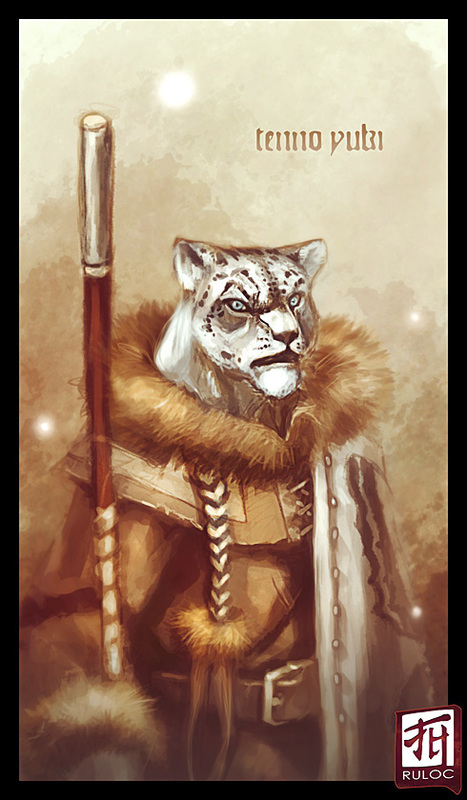 5'2'', snow leopard fur pattern on fur (black, gray, white, pale blue eyes) with a long mane of head hair of silver and dark gray tied back in a pony tail, light build but tends to wear bulky cloth armor of an Innuit design. Has a cloak with the image of a swallowtail butterfly signyfing his assosication with Desna (usually thrown over his left shoulder). He carries a pair of snowshoes, his long quarterstaff (with banded iron ends), and a sling and bag of bullets at his side. He is surounded by small heavenly wisps which are pesky spirits drawn to his Desnan blessing. They are usually very hard to see and only appear is light shimmers.